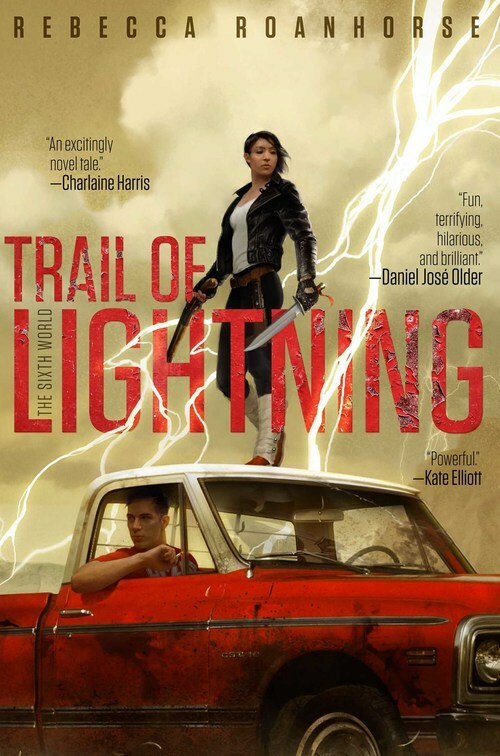 TRAIL OF LIGHTNING is the first book in the Sixth World series. The world has drowned after a climate apocalypse and the Navajo reservation, now Din�tah has been reborn. It's a new world where gods and heroes walk the land. But, it's also a world filled with monsters. Maggie Hoskie is a Din�tah monsters hunter. She survived an attack by monsters when she was young and was trained by Neizgh�n� the Monsterslayer of legend, the son of two holy people. However, now Neizgh�n� has left her and she has to fight on her own. A new job has her hunting a monster that has abducted a small girl. This monster is something entirely new to her and she will discover this is just the start of a nightmare. As a fan of dystopia novels was I curious to see how the first book in a new series would turn out. I'm glad to say that I was impressed, both by the world building and the story. Not to mention the characters. Maggie Hoskie is the kind of female warrior with supernatural powers that I love to read about; strong, but with a past that has hurt her deeply. She has a hard time letting people get close, although the few she allows she is a true friend of. And then there is Neizgh�n�. I was immensely curious about this legendary Monsterslayer who saved Maggie's life and for some reason left her to fend for herself. Adding to the mix is the medicine man Kai Arviso who comes to Maggie's aid when she tries to find out more about the monster she killed. There are also several other interesting characters in the book, human, and non-human that will cross Maggie's path. One particular figure is the Coyote, who is just as legendary as Neizgh�n�. TRAIL OF LIGHTNING left me wanting more. I'm intrigued by the Din�tah world, and also by the world outside Din�tah, outside the Wall. Rebecca Roanhorse has created a fabulous new series, with characters that I have come to love and I'm looking forward to reading the next book.